We don’t know the desperation which led a mother to abandon her precious, newborn baby. We only know that God saw him and brought him the mother he desperately needed. Lenkai is a lively, happy 11-year-old boy. 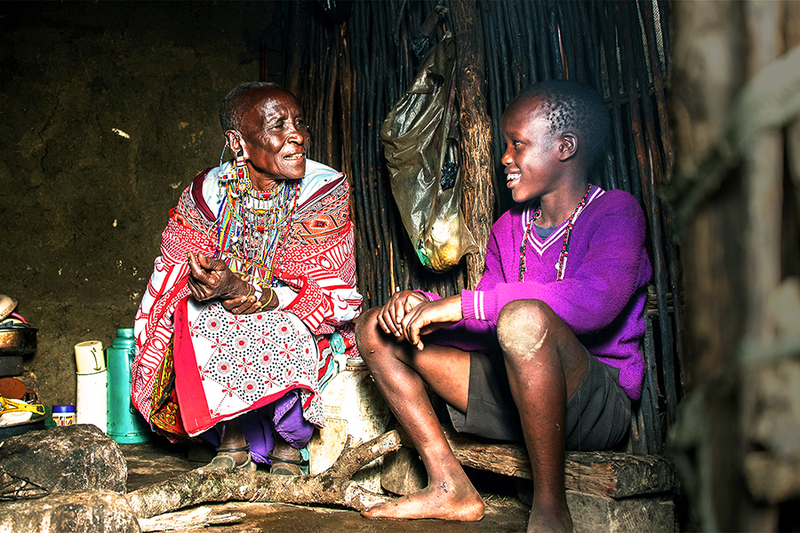 He’s very tall for his age which is common for the Maasai people of Kenya. He loves singing and dancing, playing football, and reading the Bible. Lenkai knows he is loved by his foster mother, his extended family, his friends and mentors at the Compassion child development centre, and—most of all—he is loved by God. But Lenkai didn’t always have so many people to care for him. He was abandoned, cast aside and left to die of thirst and hunger. As a newborn Lenkai was left to die under a bush in the wilderness. Wrapped in a colourful blanket, with his umbilical cord still attached to his scrawny body, he cried out for help with his tiny, newborn voice. As the hours passed, dehydration took hold of his body; he was slowly dying. Although Lenkai was alone and in a desperate situation, God saw him under that bush and knew the best person to help him. Nasinde couldn’t have children; it was a shameful thing among her people. “Without children, we are nothing,” she says. Her neighbours looked down on her and her husband hit her. Her grief was multiplied when her husband married another woman. Nasinde couldn’t bear the shame any more. She moved home to live with her brother and his wives; supporting herself by helping on her brother’s farm and selling beads. Nasinde prayed that one day she would have a child but, as the years passed by, her hope of ever being a mother faded. Eleven years ago, during the hottest part of the day, one of Nasinde’s neighbours rushed into her yard, frantically yelling and trying to drag Nasinde into the bush. Nasinde reluctantly followed her to where Lenkai lay—still crying for help. She reached down and gently bundled him up, cuddling and comforting him, and checking to see if he was injured. “He was nibbling his little fingers and his eyes were swollen from crying,” she says. But, apart from being dehydrated, he was healthy. Nasinde cared for Lenkai while the police searched for his mother. When they couldn’t find his family, they asked Nasinde to care for him. She was delighted; she named the tiny baby Lenkai, meaning “God’s son”. Although she barely had enough income to look after herself, she agreed to raise him as her son. “We should all strive to help, no matter how little we have,” she says. When the people in the village heard about the little boy rescued from the bush, they all came to help: giving food, clothes or anything else they could spare. “This was indeed God’s son, and He was taking care of him,” says Nasinde. As Nasinde grew older, her frail body could no longer bear the strain of hard physical labour, and their income dwindled. Two years ago, Lenkai was enrolled in the Calvary Baptist Entashata Church Child Sponsorship Program and the staff realised that the poverty of the family was extreme. Lenkai and Nasinde now receive food rations and additional support through the Highly Vulnerable Children fund. “Rejoice in the Lord always. I will say it again: Rejoice!” Lenkai grins, as he quotes his favourite Bible verse. He rejoices in the hope he has in Jesus Christ and looks forward to a future when he can help others, just as Nasdine has helped him. You can help highly vulnerable children just like Lenkai.